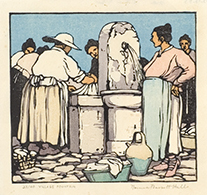 “Chipping the Block, Painting the Silk: The Prints of Norma Bassett Hall” will run Aug. 7 through Dec. 15 in the Beach Museum of Art’s Wefald Gallery. Works displayed are from the first solo exhibition of Hall’s art since her death in 1957. Guest curator of the exhibition is Joby Patterson, an art historian based in Eugene, Oregon, and author of a book about the artist. Hall was educated in early 20th-century America when the arts and crafts movement was all the rage. 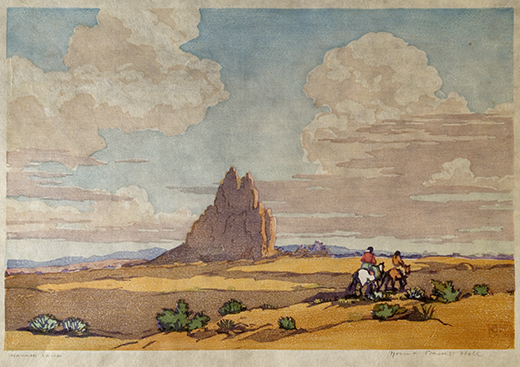 This training is revealed in her Japanese-influenced compositions and printing methods, according to Patterson, who also notes that Hall found inspiration in the diverse landscapes she encountered in her extensive travels. As guest curator of “Chipping the Block, Painting the Silk”, Patterson will share her decade of adventures researching Hall and organizing an exhibition about her work in a presentation from 5:30-7:30 p.m. Thursday, Nov. 1, at the Beach Museum of Art. A book signing will follow. 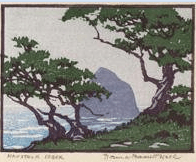 “Japanese Woodblock Printing in the West,” from 11 a.m. to 4 p.m. Saturday, Oct. 6, at the Beach Museum of Art. The display is part of the Art in Motion festival, a free celebration of art for everyone.